The driving experience for drivers is, quite frankly, rubbish. No longer are you allowed to use your phone, play with the radio or even pick your nose without the danger of the police picking you up. For passengers, though, the humble car has become a one-stop shop for entertainment. 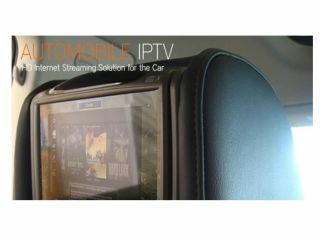 To add that little bit extra to in-car excitement is Matrix and its high-definition IPTV terminal, the MX-Drive. Not only does the MX-Drive have a touchscreen, it also houses MatrixCast video streaming technology that allows users to stream video on-demand titles and live TV channels in standard definition and high definition. Speaking about the new product, Robert Liu, COO of MartrixStream said: "Whether you're a business person needs to keep up to date with the latest stock news or a parent who wants to keep your children occupied during extended road trips, the MX2 wireless terminal touchscreen will keep car and minivan tuned in all ride long." That is if there's a wireless internet signal available wherever you are driving too. Although the MX-Drive is said to work over "very low" bandwidth. There's no word on a UK release or pricing just yet, but if you and you're family are going to be crusing the highways of the US soon, then this could be for you.